Non-governmental organizations have played a major role in pushing for sustainable development at all levels. The term NGO is used to describe groups and organizations delivering aid and providing essential public services for development. Some Non-Governmental Organizations are research-driven policy organizations, looking to engage with decision-makers. While other organizations see themselves as watchdogs, casting a critical eye over current events. Accordingly, they are able to devote themselves to issues which occur across longer time horizons, such as climate change, poverty, women rights, humanitarian issues, hunger, or disease prevention. Public surveys reveal that NGOs often enjoy a high degree of public trust, which can make them a useful and a proxy for the concerns of society and its people. There are other Non-Governmental organizations which prefer to remain at a distance, by monitoring, publicizing, and criticizing in cases where authorities fail to seriously create their impacts upon the wider community. However, many are showing a willingness to devote their energy and resources to working alongside the government, in order to address the societal and humanitarian issues. Non-Governmental Organizations can help to tackle problems that the government alone can’t. For example in Canada, about 12,000 people experienced homelessness in Ontario each night, reported by CBC news portal in 2017.Finding a permanent place to call home is a nearly impossible task in the country. Over 170,000 households are on the waiting list for affordable housing in Ontario and the average wait time is four years, according to the Ontario Non-Profit Housing Association. In 2014, though the provincial government had released a five-year poverty reduction strategy with a focus on homelessness which currently contribute $324 million each year to helping people avoid homelessness. Unfortunately, this isn’t enough because we have seen that homelessness issue still subsists in the country. Financial stability is the most pivotal issue for the Non- governmental organizations.If the organizations are in financial distress themselves ,it is obvious that they cannot help the society to its fullest.Most of these organizations aren’t permitted to make a profit which is why donations serve as the backbone for them to run their specific programs. Life is all about giving and taking. When we open our hearts to show the act of kindness and compassion it fill us with goodness. If we don’t give and take in our daily lives , we have nothing to aspire. To give and take is the gift of life. Giving genuinely make the world a better place which is associated with honor, promoting peace and pure living. Some people and organizations have comprehended that goodness of life is a process and not a state of being. Giving and goodness have a ripple effect. Kindness attracts kindness.When everyone will stand together to support specific cause ;changes are bound to come. To make sure your hard earned money is dedicated to the right and the most deserving cause we have enlisted a few Canadian organizations which you can consider to make a donation whenever you want. 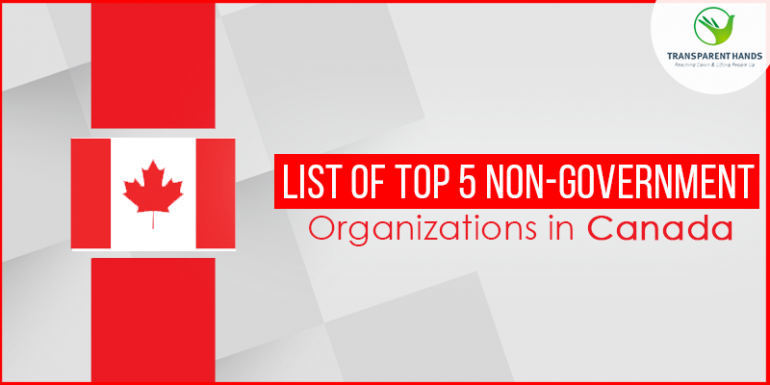 TransparentHands is in First position in our List of Top 5 Non-Government Organizations in Canada. We are blessed with good health and wealth and it’s their duty to further utilize them for the service of mankind. Even a small amount can create a lasting impact on someone’s miserable life. Spend your wealth in a noble cause and change the lives of deserving people of Pakistan. The amount which you’ll contribute towards the surgeries of these poor patients will bring them back to better health and improve their living. With the help of Crowdfunding by kind donors like you, many people under Transparent Hands were given medical relief. But there are still thousands of people who are in dire need of your support and are waiting for a miracle which could save their lives. Together through fundraising, we can give new lives and hopes to many deserving patients in their country. Let’s unite and make effort in making Pakistan an ideal place to live. Transparent Hands conducts the surgeries of deserving patients free of cost at private hospitals with the help of donations and charity. Donors from all over the world can use their online Crowdfunding web portal if they wish to donate. They could select any patient, fund the surgery and receive regular feedback and updates until the patient is recovered completely. What makes us unique is; their transparency level that means donors will be ensured that each penny they are giving will be spent on the needy patient. We do this by uploading all the hospital bills and other documents of their patient after his/her surgery is successfully conducted. Donor can see that the exact amount hospital has charged against the surgery of that particular patient. Kickstarter is in second position in our List of Top 5 Non-Government Organizations in Canada. Kickstarter is an enormous global community built around creativity and creative projects. Over 10 million people, from every continent on earth, have backed a Kickstarter project. Some of those projects come from influential artists like De La Soul or Marina Abramovic. Most come from amazing creative people you probably haven’t heard of — from Grandma Pearl to indie filmmakers to the band down the street. They built Kickstarter to help bring creative projects to life. They measure their success as a company by how well they achieve that mission, not by the size of their profits. That’s why, in 2015, they became a Benefit Corporation. Benefit Corporations are for-profit companies that are obligated to consider the impact of their decisions on society, not only shareholders. Radically, positive impact on society becomes part of a Benefit Corporation’s legally defined goals. When they became a Benefit Corporation, they amended their corporate charter to lay out specific goals and commitments to arts and culture, making their values core to their operations, fighting inequality, and helping creative projects come to life. You can read their commitments in full below. They’re an independent, founder-controlled company of 114 people working together in an old pencil factory in New York City. They spend their time designing and building Kickstarter, connecting people around inspiring creative projects, and having a lot of fun doing it. They’re developers, designers, support specialists, writers, musicians, painters, poets, gamers, robot-builders — you name it. They’ve backed more than 34,000 projects (and launched plenty of their own). They had the craziest 24 hours ever. They saw $1 billion get pledged. They shared the early designs behind Kickstarter. They learned what a Kickstarter project looked like back in 1713. They talked about why Kickstarter matters. They made some important changes to how they govern the site. They put on film festivals in 2011, 2012, 2013, 2014, and 2015. A project won an Oscar. And after five years, they made a video about it all. CauseVox is in third position in our List of Top 5 Non-Government Organizations in Canada. CauseVox is a community-driven fundraising platform trusted by thousands of fundraising teams at nonprofits to help them activate their supporters, reach new donors, and raise more online. Before they started CauseVox, they found ourselves volunteering at nonprofits to scale their impact. They worked on everything from systems implementations to marketing projects for NGOs in South Africa, Uganda, and India. One of the puzzling things that came up was why people, who were making such a profound change in communities, struggled with scaling their social impact. Why did they have to fight in order to make this world a better place for all of their to live? Back in the States, they dug around for the answer. They talked to hundreds of people — people that volunteered, people that worked at nonprofits, and founders of nonprofits. They joined an incubator for social good and a community group for social entrepreneurs. They even moved from Washington DC to NYC to be closer to the nonprofits that they knew. They really wanted to figure out why there was a struggle. The one thing they kept on hearing was that raising funds was always a challenge and using technology was always hard; these people were struggling for funding and wrangling with software every day. They always were trying to find new ways to find new donors. Major donors and grants were drying up because of the recession. Galas and events were too costly to organize. After testing the crowdfunding concept on their own volunteer projects — they built their own crowdfunding platform to raise funds for their volunteer projects — they launched CauseVox for all nonprofits and individuals to use. They wanted to find a way for nonprofits and social good projects to raise funds online that is affordable, easy to use, yet powerful enough for professionals. That first few months, they helped a nonprofit raise over $75,000 in 40 days. They launched a crowdfunding campaign with SXSW that raised $125,000 in 10 days. One of their advisors was stabbed seven times in a mugging and they helped raise $43,000 for his medical bills. Since then, they’ve helped tens-of-thousands of people fundraise online, serving thousands of nonprofits every year. Their mantra today is to help good things flourish. Managing your online fundraising, everyday donations, and peer-to-peer campaigns should be simple. With CauseVox, you can keep track of your online donations, quickly access the data you need, and see a real-time view of donations coming in and easy ways to download what you need or integrate directly with your other fundraising tools. Indiegogo is in fourth position in our List of Top 5 Non-Government Organizations in Canada. Millions of people around the world visit Indiegogo to find clever and unconventional things that solve everyday problems large and small. By giving entrepreneurs everywhere a platform to launch new and groundbreaking products, they help surface innovations in tech, design, and much more, all before they go mainstream. Powered by curiosity, the Indiegogo community has helped bring more than 800,000 innovative ideas to life since 2008. Today, their group of backers is more than 9 million strong, representing 235 countries and territories. Always on the lookout for new solutions to everyday problems, their community thrives on making clever discoveries before everyone else. From live campaigns to ready-to-ship tech, curious humans rely on Indiegogo to find the latest innovations in tech and design. Their founders were inspired to create Indiegogo based on their own experiences trying to make ideas come to life. Danae Ringelmann produced a play but couldn’t get funding to take it to the next level. Eric Schell struggled to fundraise for a Chicago theater company. Slava Rubin tried to raise funds to find a cure for Multiple Myeloma, the disease that killed his father. Then, they had an idea. They could use the internet to bring people together to empower innovation. 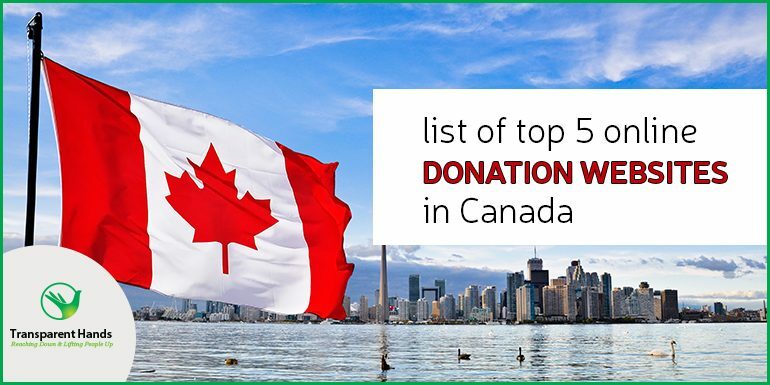 GoFundMe is in fifth position in our List of Top 5 Non-Government Organizations in Canada. Launched in 2010, GoFundMe is the world’s largest social fundraising platform, with over $5 billion raised so far. With a community of more than 50 million donors, GoFundMe is changing the way the world gives. Start fundraising in minutes. No goal requirements, no deadlines. Join the millions who have raised more than $5 billion on GoFundMe. Their campaign coaches will answer your questions, day or night. The GoFundMe Guarantee protects your donations and supporters. It takes a leap of faith to help someone else. That’s why they want to honor your generosity by backing it up with the first and only guarantee for crowdfunding: the GoFundMe Guarantee. In the rare case that something isn’t right, they will refund your donation. Every day, thousands of people get the help they need from generous donors. Their team of specialists work night and day to make sure that funds get to the intended recipient, every time. If funds aren’t delivered to the right person, they will donate the missing amount. Signing up is completely free and every donation is yours to keep, whether or not you reach your goal. While it’s free to launch your GoFundMe, fees are deducted from each donation. For more information on their fee structure, click here. If you’re raising funds for yourself or a friend, you can create a personal campaign. If you’re raising funds for an organization, contact their team using the button below to discuss your best options. The process is simple to complete and allows you to create a high-quality GoFundMe from your mobile device or computer. To create a compelling story, make sure to write a thorough campaign story and use high-quality photos and videos. Don’t forget to customize your GoFundMe link to make it easier to remember! The GoFundMe link is the easiest way for your supporters to locate and donate to your GoFundMe. Once you’ve finished creating your GoFundMe, you will be taken through all of the options to share. If you’re not ready to share yet, don’t worry. You can simply review all of the sharing options, but skip until you reach your Dashboard. You’ll be able to set up or edit your sharing preferences at any time. Although NGOs do not have the government’s power and are not part of a government, they still can influence the government through various external efforts. In today’s world, non-governmental organizations provide services that fill gaps left by the private and public sectors. We have to understand the reason that why this gap exists and the incentives of the different stakeholders of society. Many controversial issues in the society are ignored till they reach crisis proportions. So Non-Governmental Organizations are left to provide services that would otherwise be provided by the government. On one hand, their work often requires working closely with people that they are trying to help. So a trust-based relationship allows NGOs to get closer to people’s lives than any private sector organization could. The Food Banks of Canada in 2017 reported that 13% of Canadians live in a state of food insecurity, which means they do not have reliable access to adequate amounts of safe, and nutritious food. The root cause of hunger in Canada is low income, which consistently affects more than 4 million people. Food banks are an important method of addressing this need. Each month, over 850,000 people turn to food banks for help. Helpless people visit food banks coming from all backgrounds. They include families with children, employed people with too low wages who cannot cover basic living needs, including seniors and people with disabilities. Now food insecurity, homelessness, orphan hood, poverty are only a few facets of the existing societal issues. There are many more adversities in the society that must be addressed. These issues can only be resolved when we all stand upright and together because it’s all about how we can make a difference not just in one life but in the lives of the thousands who are deserving..
We can donate to the deserving Non-governmental organizations so that no one has to go without a meal. We can donate to organizations working for children and family welfare so that no child ever gets orphaned. We can donate to old homes so that every old person gets proper care and lives with held high. We can donate to organizations working for the unemployed so that no family has to live in poverty. Hence, funding for Non-Governmental Organizations is important so that they can provide best services to the needy. All Non-Governmental Organizations count on the credibility of donors which lets them keep their promises to provide a service that is often neglected by the public and private sectors.